Refugee flows through Greece’s land borders have started rising again, causing frustration among EU and Greek authorities. According to UNHCR data, in April alone 2,900 people entered Greece via land passages at the borders of Evros River, mainly families from Syria and Iraq. EURACTIV Greece reports. Press reports say that increased migratory flows across the Evros are the result of the latest tensions in the Greek-Turkish relations. According to the same reports, the Greek authorities suspect that Turkish border guards may have deliberately become less attentive, effectively turning a blind eye to the refugees attempting to cross into Greece, in order to pressure Athens and Brussels about the EU’s indefinite postponement of visa liberalisation for Turkish nationals. 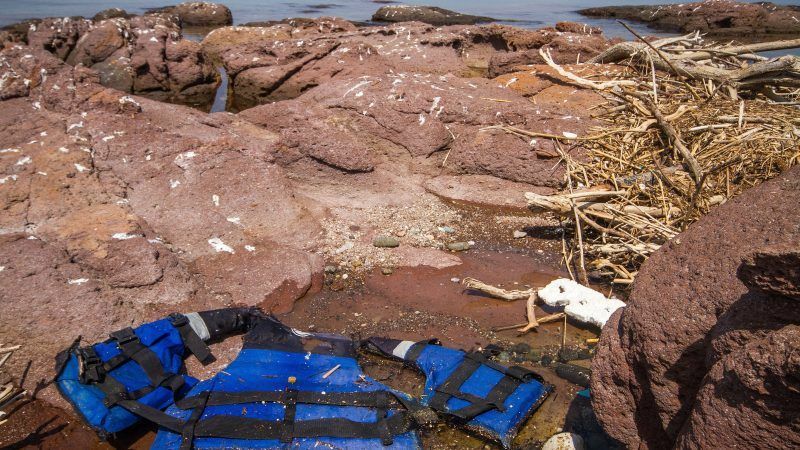 In the meantime, the European Border and Coast Guard Agency (Frontex) is ready to boost its support at the land border between Greece and Turkey due to increased migratory flows, said Natasha Bertaud, a European Commission spokesperson. In the first four months of this year, a total of 7,300 people entered Greece, compared to 4,761 arrivals counted last year, according to the International Organisation for Migration data (IOM). Currently, more than 13.500 refugees are hosted in temporary facilities with a capacity of only 5.500 people in the islands of Chios, Samos and Lesvos. “Over-concentration of people creates complex situations that are hard to describe,” Christiana Kalogirou, the governor of the North Aegean Region, told a recent conference on migration in Brussels. “For three years now, in the North Aegean islands, we’ve been experiencing all the consequences, both in our everyday life and in our wider economic activity. Consequences that day by day become structural and make the management of the situation even more difficult”, she said. Recent tensions at the camps caused by the arrival of even more refugees in Lesvos, Lagadikia and Diavata prove that a lack of coordination between European and Greek authorities is a bigger issue than it seems. As a result, the regions end up practically having to deal with the increased flows of refugees on their own, without adequate guidance and infrastructure. Furthermore, the fact that the regions are unable to access the Asylum, Migration and Integration Fund (AMIF) is making it even more difficult for them to address the immediate needs in hosting facilities, asylum procedures and integration of refugees. “The government’s apparent inability to distinguish refugees from illegal migrants upon arrival has intensified the situation, which has got even worse due to the lack of political will and the time lost for the establishment of a flexible legal framework for asylum,” MEP Maria Spyraki (EPP) told EURACTIV. She said it was high time to make the distinction between refugees and illegal migrants. “Those who do not receive asylum should be hosted in closed-type hosting facilities in order to return later to their countries of origin,” she said. MEP Eliza Vozemberg (EPP) said the increased arrivals were also a cause for concern for the summer tourist season. “During tourist season, it is very likely that once again we will witness at the Greek islands scenes like the ones we experienced in the summer of 2015, with painful consequences for the tourist traffic and the local economies”. Dimitris Papadimoulis (GUE/NGL, SYRIZA), the vice-president of the European Parliament, told EURACTIV the Parliament’s support to the Greek government on the refugee issues was strong and “demonstrated in related resolutions”, which highlighted the principles of solidarity and fair distribution of refugees among member states. “At the same time, there is an ongoing dialogue within the Civil Liberties, Justice and Home Affairs Committee (LIBE) and clear support for our country through the positions of the majority of MEPs…. Lastly, there is strong and intergroup support for the resolution on the children of migrants and refugees, the continuation of the relocation program and the reunification of families,” Papadimoulis added. In the first four months of 2018, 18,939 refugees and immigrants entered Europe, while last year there were 44,558 arrivals, according to IOM data. In 2016, more than 172,000 refugees arrived in Greek islands, while a year earlier that figure was 872,519, according to the Hellenic Republic’s General Secretariat for Media and Communication.